Andrésy Confitures now offers major hotels an organic coffee of the very highest quality for their top-end breakfasts and room service. Its winning features include its rich aroma, freshness, certified quality and fully-biodegradable capsules. Are you familiar with Mademoiselle Adèle, Le Jeune Arthur, Mister Nelson and Monsieur Albert? Don’t worry… These imaginary characters personify the Terramoka® coffee collection. It is produced by a French company headed by Philippe Sauzay. Terramoka® is already sold by organic shops, garden centres, pasty shops and gourmet groceries. Now it hopes to expand into the premium hotel market. Andrésy Confitures, for its part, likes to explore new territories, work with dynamic, dependable partners, and bring its customers outstanding products. Both of these companies have opted for uncompromising excellence and respect for consumers and producers, and share a concern for innovation, mindful consumption and Corporate Social Responsibility (CSR). Philippe Sauzay is a graduate of the ESCI Business School in France and a specialist in human biology. More importantly, though, he is an avid coffee enthusiast, an explorer of new tastes and flavours, and a fervent advocate of life and nature. Over the past 10 years, he has been developing new generations of freshly-ground coffee, certified allergen and GMO-free. For Terramoka®, he seeks out the best varieties in South America and Africa. The hand-picked beans are roasted using artisanal methods, then blended by the best specialists, two coffee experts recognised as French champions in the field. Did you know that coffee is the world’s most commonly-consumed beverage, with annual consumption totalling 9.4 million tonnes in 2017? Coffee machines, from the most basic to the most luxurious models, are now found everywhere from home kitchens to professional premises, and coffee capsules are selling by the billion. Though capsules may be convenient, many consumers are concerned about adding to the pollution problem. To date, there isn’t a single capsule that is fully recyclable. Philippe Sauzay took up the issue and developed a unique technology that has allowed him to design the first capsule made entirely of bio-sourced materials. 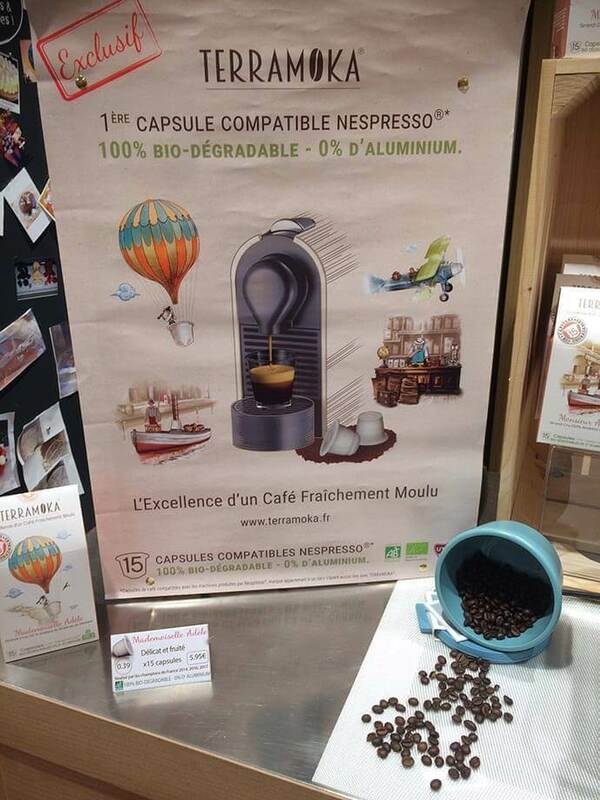 It is aluminium free, fully biodegradable and compatible with Nespresso®* coffee machines. The technology behind it and the quality of its coffee have earned it a number of certifications: Agriculture biologique, Vinçotte OK Compost, 100% biodegradable and UTZ. Andrésy is leveraging its excellent reputation with 4* and 5* hotels in France and abroad to offer them an organic coffee of the very highest quality, whose rich aroma and delicate taste is sure to please. The above-average capacity of the 5.6g capsules make them perfect for delicious long coffees. This product also addresses hotel managers’ concern with reducing their waste and bolstering their CSR strategy. It further enhances their image in the eyes of customers who are increasingly well-informed, and concerned about their health and protecting the environment. A coffee that will feature prominently alongside the many varieties of Andrésy jams, on all of the world’s finest breakfast tables.